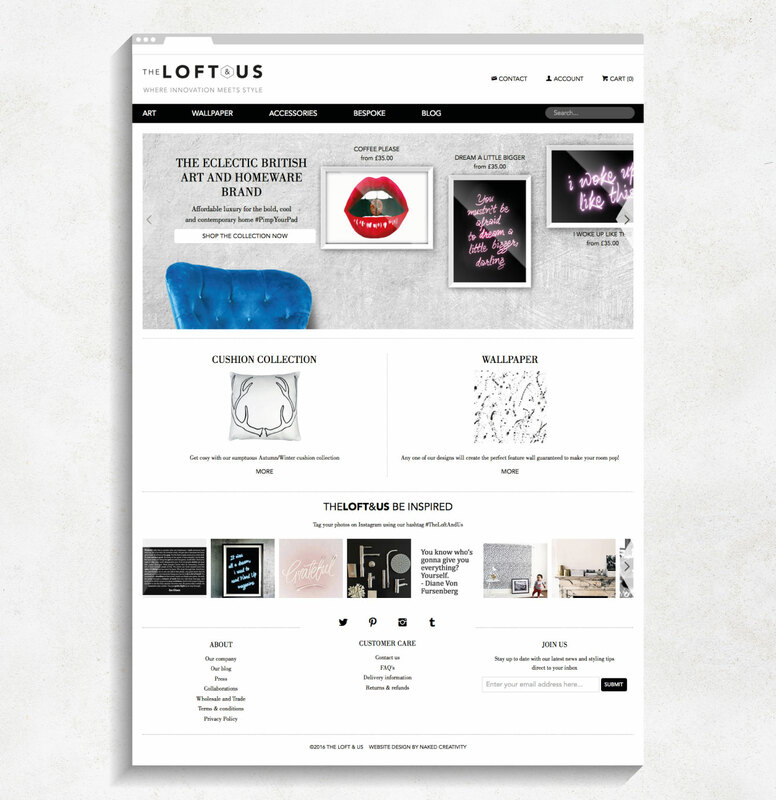 The Loft and Us is a boutique art and interiors store selling prints, cushions and wallpaper. Naked Creativity have been involved since the outset of the project, working to create the identity, website and now handling much of the order fulfilment through our large format print subsidiary, Captain Cyan. 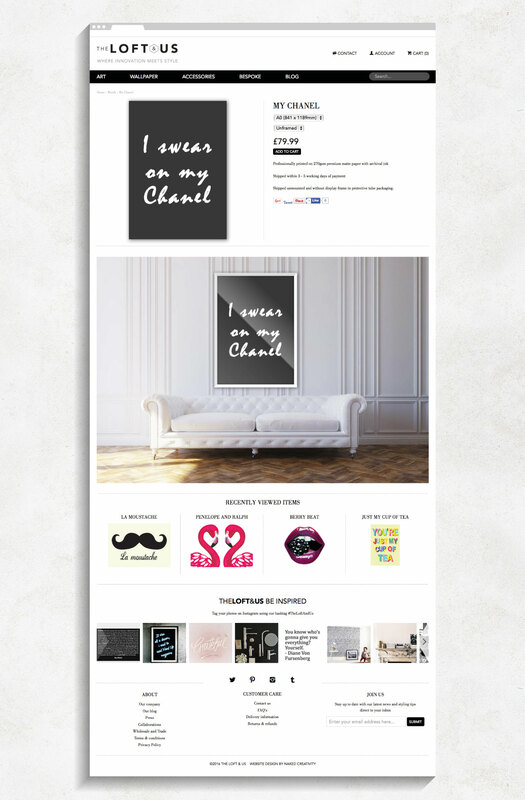 The website is built on the powerful Shopify ecommerce platform. 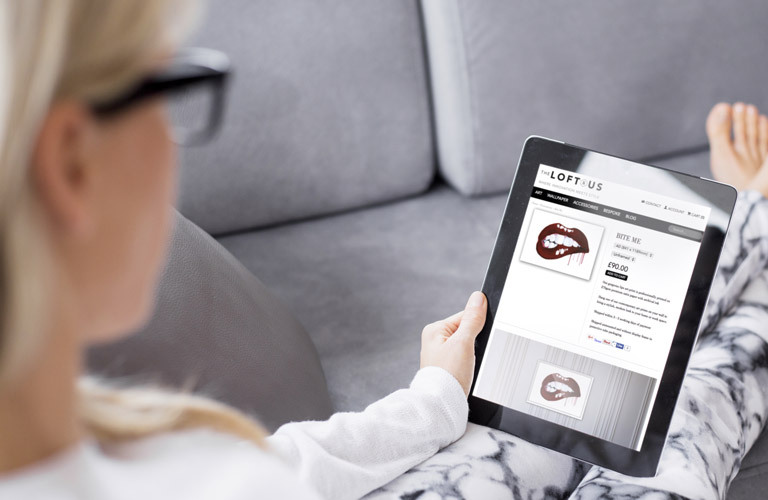 Shopify is perfectly suited to small or large ecommerce operations. It is highly scalable, and as a subscription service, the initial costs are minimised. 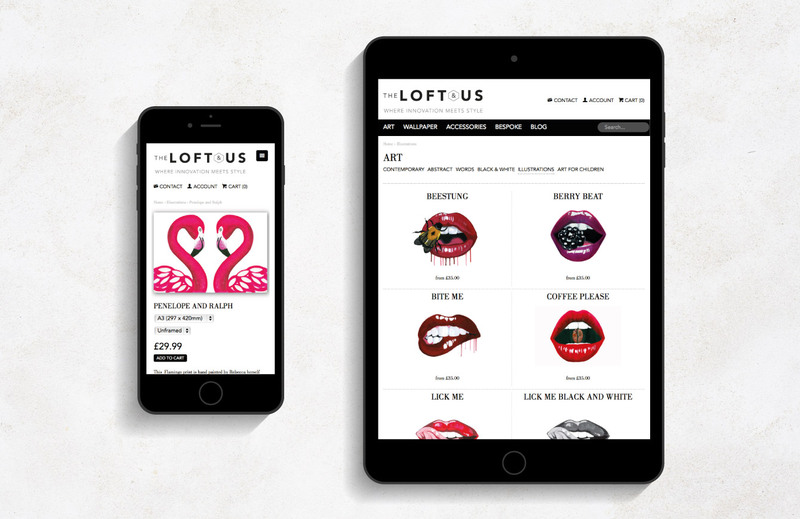 The Loft and Us uses a customised Shopify theme, these themes determine the look and feel, and interactivity of a Shopify ecommerce site. There are many standard, or low-cost, themes available that offer a great starting point, and a way to reduce the initial outlay. We added some highly customised elements to the theme, including a preview tool that shows the approximate size of each print within a room setting. This preview scales on desktop and mobile devices to give customers and accurate idea of what A0, A1 and A2 will really look like. 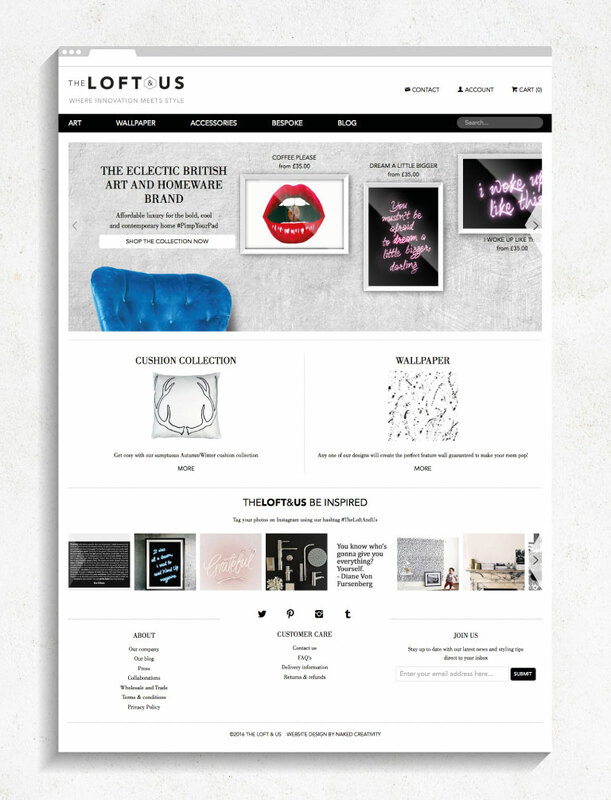 Naked Creativity are Shopify Partners and can assist with anything from setting up stores, to building themes, to building tools that interact with the Shopify API. One of these tools in also in place on The Loft and Us – we automatically update data within the store to integrate images from their Instagram feed. 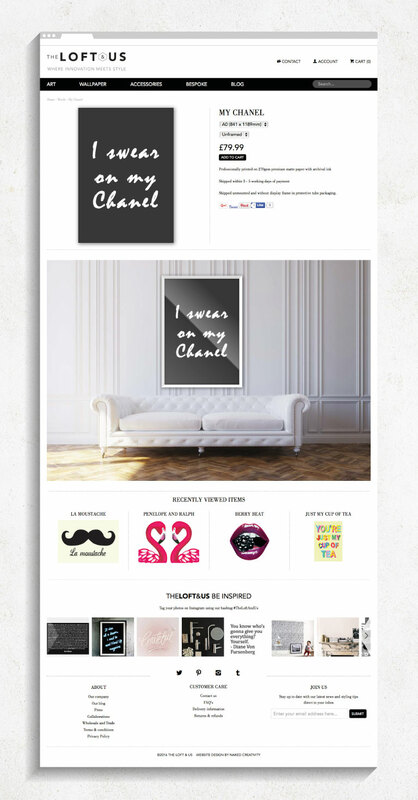 Jordan and the team were simply invaluable when it came to helping me mould my business model and brand. Although I had already created the shell of my own website I still needed to design and create my brand logo and basically set up my entire business system, from implementing the necessary accounting software right down to registering my company. I was really jumping in at the deep end but they made me feel at ease and ensured client satisfaction was of the upmost importance throughout our initial relationship. I still use their design and consultancy services to this day, whether it be with the incredibly talented Emma and her fantastic design skills or reaching out to Jordan who seriously knows more about website and general software related jargon than any other man I've come across on the planet! I honestly couldn't recommend their services enough and have done so on many occasion.